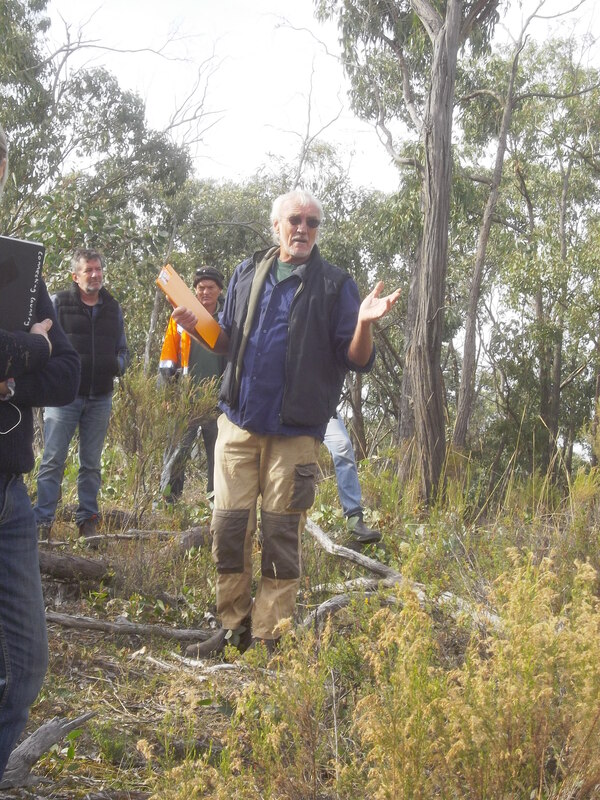 On Friday the 5th of May 2017 thirty participants heard from Muckleford landholder, Paul Hampton; Ecologist, Paul Foreman; and local contractor, David Griffiths about the benefits, challenges, and approaches to ecological thinning in remnant vegetation. Participants visited a four year old thinning trial and heard about the fascinating pilot project. Paul Hampton outlining the history of the trial. Paul Hampton gave attendees a brief history of the property and the thinning trial. The property is subject to a Trust for Nature covenant and is co-owned by a group of friends including Paul. He also outlined the annual maintenance work required in the upkeep of the trial; in particular, controlling coppice growth. Paul Foreman from Blue Devil Consulting used the example of a thinning trial undertaken by Parks Victoria in partnership with Ballarat University about ten years ago in our local region. This trial was monitored in subsequent years and Paul outlined the main findings from this trial and monitoring effort. Paul also talked about how a small catchment wide approach to thinning could improve landscape function and water quality whilst providing gains for biodiversity. Paul Foreman explains that more light, retained water and microdisturbance can activate a shrub layer in bush that has been thinned. 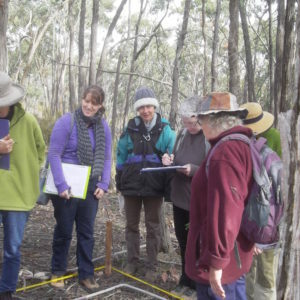 Attendees were split into two groups and undertook a comparative vegetation survey in one of two ten meter square quadrats, one with thinning and one without. 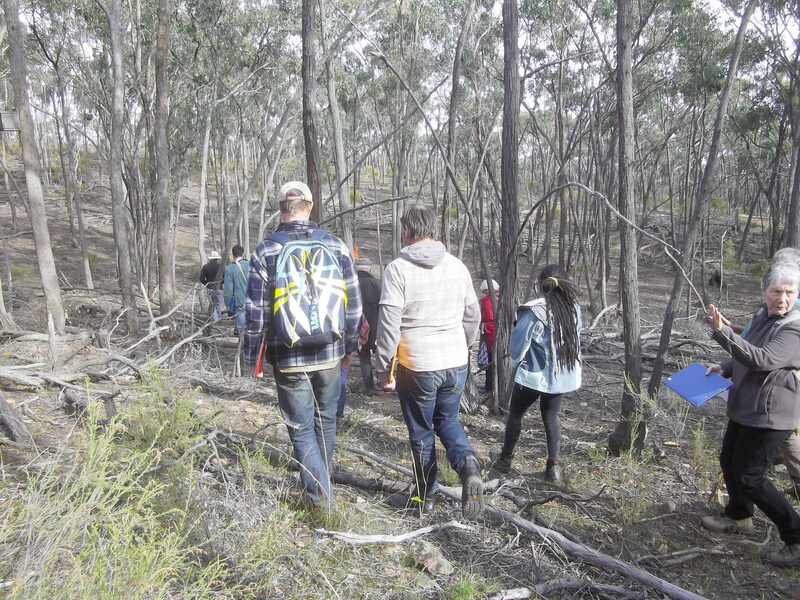 This enabled people to see and measure what some of the impacts of thinned bush. Plant species identification was an added bonus to this exercise with Connecting Country staff, Paul, and some knowledgable participants sharing new plants and botanical terms. 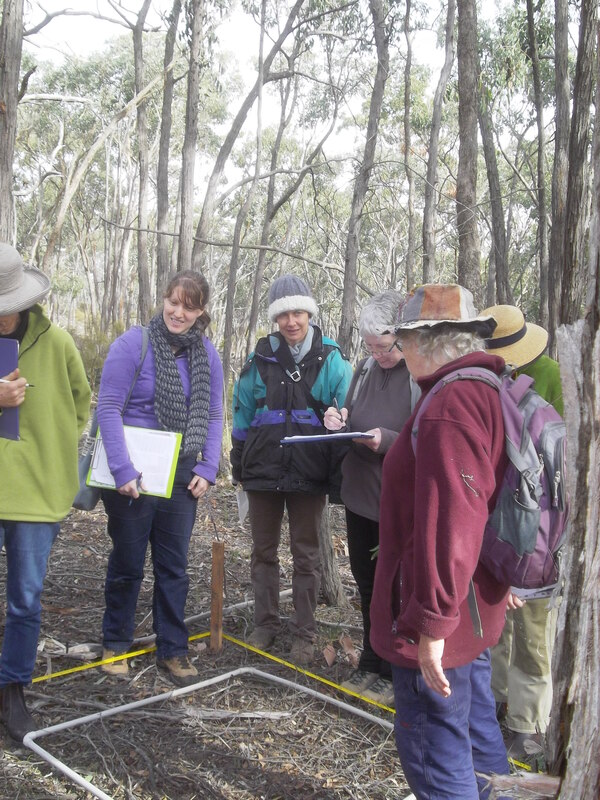 Asha and a group of attendees discuss and record the vegetation found in their quadrat. The comparison of results from the two groups highlighted the main differences included more shrubs, recruitment and course woody debris found in the thinned plot. Following this discussion, the whole group left the edge of the track and walked through the thinning trial. During this walk people were able to explore the trial close up while dodging the fallen timber and emerging shrub layer. Participants making their way through the thinning trial. We stopped on a rocky outcrop and heard from David Griffiths from Geometree who was employed as the contractor to carry out the tree felling of the trial. 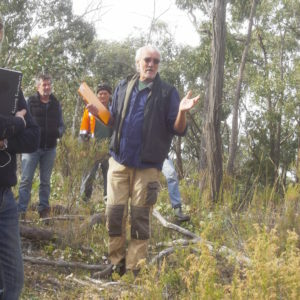 David highlighted that his job was to carry out the land management plan which had approval from Trust for Nature, Mount Alexander Shire Council, the relevant State Government department. Some discussion was held around this approvals process and Paul Hampton shared his experience and how the trial had been externally funded. 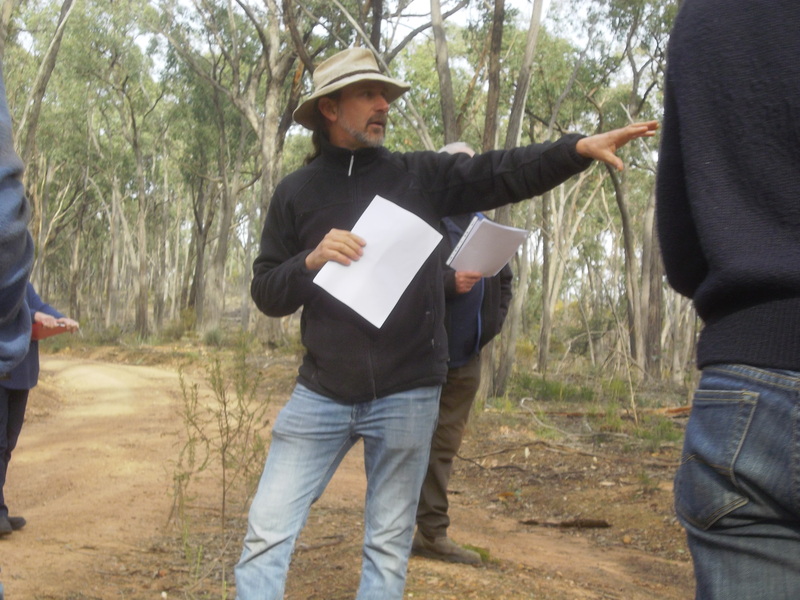 David Griffiths explains his execution of the trial’s land management plan. 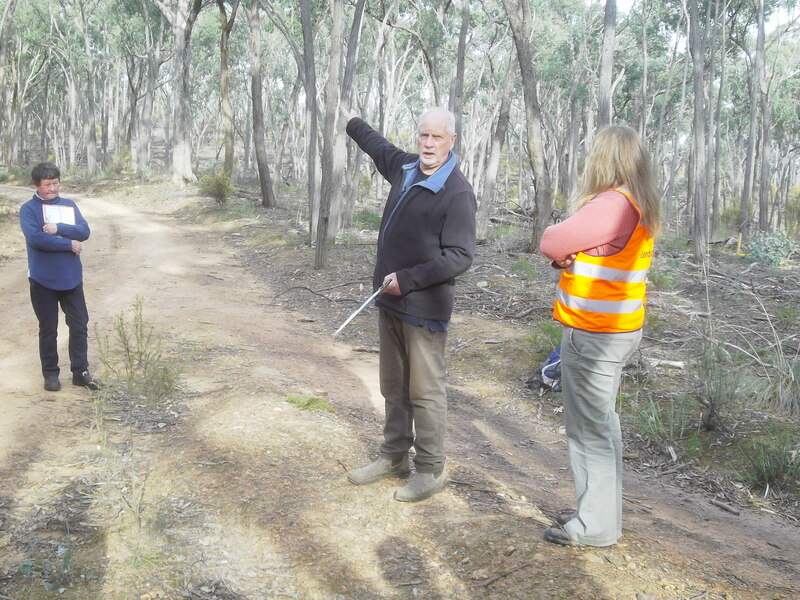 Following this discussion the group walked to one of the landholders’ carports for a a cuppa where David finished up his talk by outlining some safety considerations for undertaking this type of work. Marie Jones from the Connecting Country Committee of Management thanked the attendees, presenters and Krista Patterson-Majoor who facilitated the day. Paul Foreman’s handout and work sheet from the day – click here. A list of Personal Protective Equipment (PPE) required for contractors by State government and recommended for those who are carrying out ecological thinning on their properties from David Griffiths – click here. Mount Alexander Shire Council is a good place to start in finding out whether it is possible to undertake a thinning trial on your property and what is required. Advice from council is that there are no ‘one size fits all’ guidelines around planning requirements for this, so they will need to come in to Council to discuss the project. It’s best to visit on one of the Planning Counter Open Days – Mondays, Wednesdays and Fridays from 8:30am to 5pm – and ask to speak to a planner. It’s best if you can bring either a rates notice or the title for the property with you. A good contact for DEWLP is Wendy Murphy where she is a Senior Biodiversity Officer. Wendy is happy to be a contact for questions, but would prefer landholders contact their council as first port of call. Guidelines from State Government can be found in the Victorian Investment Framework – Vegetation Work Standards document. Section four is the relevant section for people to read. The last part of section 4 details the process and permits landholders may need to obtain before doing any works. Pigott, J.P., Palmer, G.P., Yen, A.L., Tolsma, A.D., Brown, G.W., Gibson, M.S. & Wright, J.R., 2010. Establishment of the Box-Ironbark Ecological Thinning Trial in north central Victoria. Proceedings of the Royal Society of Victoria 122(2): 111-122. ISSN 0035-9211. CLICK HERE. Jones, C.S., et al. Empirically validating a dense woody regrowth ‘problem’ and thinning ‘solution’ for understory vegetation. Forest Ecol. Manage. (2015) CLICK HERE.